The security system problem that Hunters Land Rover of Southamptom and Land Rover don't want you to know about and they have made it quite clear, even though it does not comply with the 'Sale of Goods Act' they are not going to fix it. Shortly after that I decided to replace it with another one but this time I was looking at the 130 which had a gross vehicle weight of 3500Kg and after doing some research on the internet I placed an order with Hunters Land Rover in Southampton for a new Land Rover Defender 130 County Chassis cab. There was a couple of months wait for the vehicle so I arranged to collect the vehicle on the 1st March 2008 when the new registrations started. I specifically went for the county version as it came with a few extras and the most important item was a factory fitted anti-theft / alarm system. I did collect the vehicle from Hunters in Southampton on the 1st March 2008 and it went straight to the body shop for a week or so to have an all-aluminium tipper back fitted. Everything was Ok until the 27th August 2008. I got home from work about midnight, parked the Land Rover on the drive, had a brew and a snack, then turned in about 2 am. Got up about 7am and whilst in the front room noticed that the Land Rover did not look right, so went outside to discover that the doors were ajar and the bonnet and seats had been stolen from the vehicle. Well I thought how could this happen the vehicle as a factory fitted alarm system, any way rang the Police then to report the incident and they were going to come fingerprint the vehicle. Whilst waiting for the police to arrive I had a look round the vehicle and did not see anything untoward, so I carefully opened the driver's door and put the key in the ignition and turned it on and it was dead. So something had been done to completely immobilise the vehicle. After a good look round the vehicle I eventually found the cause of the problem. 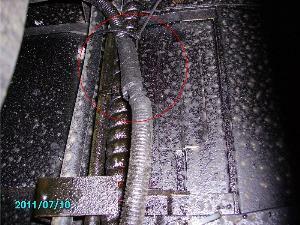 A wire had been cut underneath the vehicle. 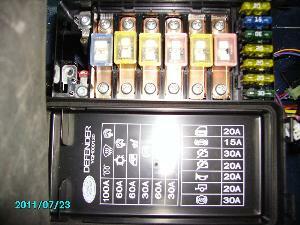 The wire was in a black plastic flexible conduit and it turns out to be the supply from the battery under the passenger seat and it feeds the fuse box under the driver's seat, and this fuse box supplies the security system for the vehicle. This wire goes from the battery located under the passenger seat through the side of the battery compartment then over the top of the gearbox on the outside of the vehicle and then through into the compartment under the driver’s seat to supply the fuse box located there. As this wire is on the outside of the vehicle it can be cut in a matter of seconds. So who in their right mind would design a vehicle security system with the wiring on the outside, it defies all logic. " Its life Jim but not as we know it." This is where the wire had been cut and subsequently repaired. 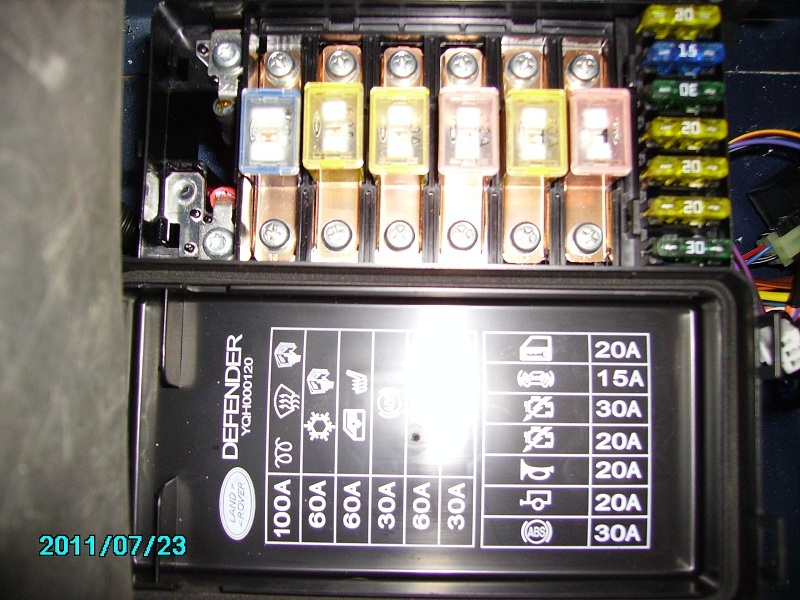 This is the fuse box under the driver's seat which supplies the Alarm System, Ignition System, Central Locking System and some other circuits. The NFU arranged for the vehicle to be collected and took it to one of their repair centres and it was off the road for nearly 5 weeks due to shortage of parts. Incidentally it was about a week before the Police went to inspect the vehicle. After getting the vehicle back I got that feeling that they would be back again to either steal the vehicle or remove parts from it again. So I started sleeping in the chair in the front room and I also then rigged up an old cctv camera in the bay window and wired it to a dvr and set up the motion detection on the dvr to give an alarm if anyone come on the drive. And sure enough within 48hrs at 2am in the morning the alarm went off and there was 2 persons with balaclava's round the vehicle. They must have seen me get out of the chair as they were no longer there when I got outside. I also drove up and down the road to see if I could locate them, but could not. As the camera was an old camera the image was not that good but the police took the footage anyway. I did continue sleeping in the chair in the front room till I obtained an outdoor day/night cctv camera and a dvr and a monitor for my bedroom. The dvr is set up to record and give an audible alarm if anyone comes on the drive, the downside of this is that bad weather, snow, rain and insects caused false triggering of the alarm so needless to say I do not get any sleep at night when the weather is bad or spiders building webs in front of the lens, and this is how it is at the present time. The good side is that there has been no more theft attempts has every one can see the camera and it emits a dull red glow from the infrared light source during the night. Also after I got the vehicle back from the repairers, I rang Land Rover Customer Care, and they advised me to take the vehicle to a dealer. So as I got the vehicle from Hunters I took it to local Hunters dealership in Derby. 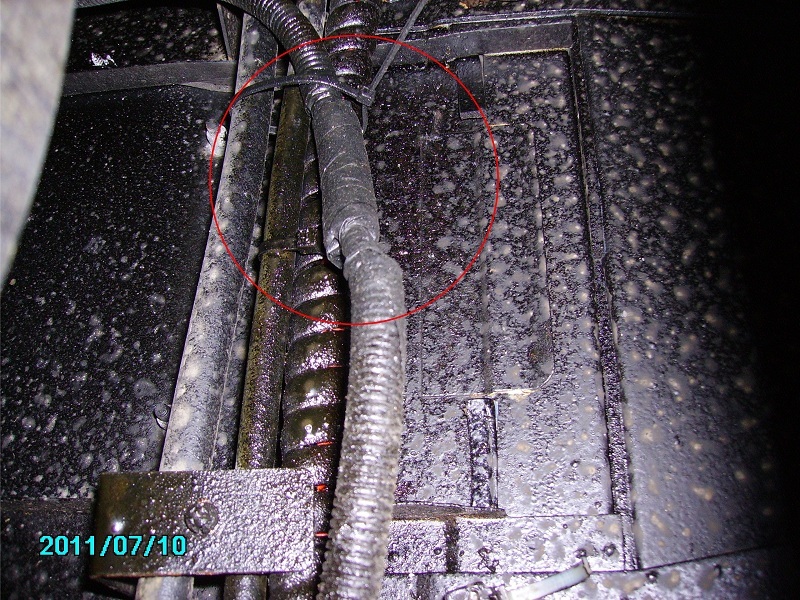 They then took photographs of the vehicle and the place where the wire was cut underneath the vehicle and sent it to Land Rover technical, and shortly after that when I contacted them, they told me that there was going to be a fix for the problem. Well the days turned into weeks and the weeks turned into months and still no fix for the problem. Rang Land Rover Customer Care a couple of times to get an update on when they were going to fix the problem but nothing was forth coming, accept on the one occasion they said that they might not fix the problem. This is the point where the paper trail starts, and over the next couple of weeks, that’s assuming I can type fast enough, I will post extracts from case files and also an engineer's report highlighting that the vehicle does not comply with the Sale of Goods Act. Here in the UK we have the “Sale of Goods Act”. This Act of Parliament was put in place to protect the consumer. Other countries may have similar Acts in place to protect the consumer. In this case my contract is with the dealer who sold me the vehicle and not Land Rover so basically the dealer gets all the hassle for Land Rover’s inability to design and implement a security system that’s fit for purpose as fitted to the land Rover Defender. Section 14 (2) of the Sale of Goods Act deals with instances where goods are usable but have some form of defect. For the purpose of this Act, goods are of a satisfactory quality if they meet the standard that a reasonable person would regard as satisfactory, taking into account of any description of the goods, the price (if relevant) and all the circumstances. On the 18th June 2009 I wrote a to Hunters Southampton and sent copies to Hunters Derby and Land Rover Customer Care. On the 23rd June I received a Phone call from Land Rover Customer Services, I remember the day well as I was looking round the Port Erin railway museum in the Isle of Man. Basically the content of the call was to inform me that 'DUE TO THE COSTS INVOLVED LAND ROVER ARE NOT GOING TO FIX THE PROBLEM' and they apologised for not letting me know after they made the decision. Yeah right, they where hoping I would forget about it. but you have to bear in mind 9 months ago they where 'GOING TO FIX THE PROBLEM' It looks like their bean counters had looked at the problem and weighed up the odds on the cost to fix the problem against the odds as to how many Land Rover owners would try and address the issue through the courts. Lets face it basically 'THEY JUST DON'T HAVE THE BALLS TO STAND UP AND ADMIT THAT THEIR SECURITY SYSTEM IS FLAWED AND IT DOES NOT COMPLY WITH THE SALE OF GOODS ACT. At the same time they also offered to fit the 'Battery Backup Option' free of charge. When I was looking through the options before I bought the vehicle I did wonder why there was a 'Battery Backup Option' and unfortunately I found out the hard way. Anyway on researching the battery backup for the alarm system I found out that it fits at the back of the left hand headlamp, so now all you have to do is remove the headlight in a couple of minutes, disconnect the battery backup and then cut the wire underneath the vehicle, so now instead of taking a couple of seconds to disable the vehicle it now takes a couple of minutes. The next sent on the 30th June 2009 to Hunters and Land Rover customer care was a summary of the conversation with Land Rover customer care plus some options to resolve the issue. The paragraph where I believed that the problem had been fixed on later models was not correct as the problem as not been fixed on the later models. I did get a from the dealers and also a reply from Land Rover customer care which was marked confidential, so not knowing the full implications of publishing a confidential letter I have left it out at the moment, but I did get a follow up from the dealers which was not confidential and in conjunction with my it will give you some idea as to the content of the confidential letter. You will have noticed the highlighted question towards the bottom of the letter and you will have probably guessed by now that neither the dealer or Land Rover answered the question. Basically this tells you allot about Land Rover and their dealers when they 'CANNOT HONESTLY AND TRUTHFULLY ANSWER A VERY SIMPLE QUESTION THAT JUST REQUIRES A YES OR NO ANSWER'. At the same time I was advised by my solicitor to send a to Land Rover customer care which basically passes all responsibility on to Land Rover in the event this happens again. I would recommend that any concerned Land Rover TDCI Defender owner do the same. The reply back from Hunters on the 11th August 2009 indicates that they had lost the plot and it is obvious that they are incapable of understanding that the vehicle is no longer a standard vehicle once it as had modified parts fitted under warranty.